Caister Castle was commissioned in 1432 by Sir John Fastolf. The 90 foot tower remains intact and visitors can climb to the top for a magnificent view of the castle ruins and the surrounding area. The castle is of historical interest both because it is one of earliest buildings in England of importance to use brick as the main construction material and because of its connection with Fastolf and later the Paston family. The Castle is currently home to the largest private collection of motor vehicles in Britain which is housed in a purpose built museum and includes many fine and rare veteran, vintage, classic, sports and touring automobiles and motorcycles. The village of this name lies 3 miles N. of Yarmouth, over the green flats that border the seashore, and Caister Castle stands 1¼ miles inland near it, upon a slight eminence on the borders of a marshy plain. It is a castellated brick building, one of the earliest in England of brick, and was built in the reign of Henry VI. (cir. 1450) by Sir John Fastolf, a celebrated character in those times, who is supposed to have been the original of Falstaff, and, if so, was much maligned. He was the son of John Fastolf, of Caister, a man of repute, married to the widow of Sir Richard Mortimer, of Attleborough. He was born about 1378, and was the ward of John, Duke of Bedford, the Regent of France, and afterwards was an esquire of Thomas, Duke of Clarence, his elder brother, with whom he went to Ireland, where he married Millicent (Tiptoft), widow of Sir Stephen Scroope, who brought him large estates in Wilts and Yorkshire. In 1417, he was at the great siege of Rouen, and the capture of Caen, Falaise, and other towns in Normandy, and was made knight-banneret on the field of Verneuel. Fastolf’s chief exploit was before Orleans at “the Battle of Herrings,” when at the head of a small force he routed a powerful army under Dunois, which tried to prevent him from bringing provisions, chiefly herrings (it being Lent), into Orleans. It is said he fled before the Maid at Patay (” Henry VI.,” Part I. ), but in company with the great Talbot and Lord Scales. Then, after being Governor of Normandy, he returned to England in 1340, and soon after obtained a licence from Henry VI. to fortify a dwelling-house “as strongly as he himself could devise.” This was Caister Castle, which he doubtless built with the plunder and ransoms he had acquired in France. Ten of the Paston letters are in his hand. At Fastolf’s death, the property, but not his great wealth, went to John Paston, the eldest son of Sir William. He seems to have lived here in much splendour, and the list of his furnishings and effects is almost royal ; he left plate in his house of 13,400 ounces of silver, besides some of gold, and 3000 ounces were left to the Abbey of St. Bennet, where he was buried, besides 2500 to his house in Bermondsey. Within three years Sir John died of the plague in London, aged forty, and the castle deservedly fell to his brother John, who had so bravely defended it. He was made a knight-banneret on the field of Stoke by Henry VII. in 1487, and died in 1503, being followed in the property by his son William, aged twenty-three, who was knighted by Henry VIII., whom he accompanied to the Field of the Cloth of Gold, dying in 1554. His son, Sir Clement Paston, built a new and grand mansion at Oxnead, and removed thither from Caister ; he died s.p., and his heir continued to live at Oxnead, and in 1600 abandoned Caister Castle. In 1660, Sir William Paston, being embarrassed for £6500, owing to a citizen, William Crow, of London, parted with the castle and its lordships and manors to this man, under whom it sank into ruin. His descendants were made Earls of Yarmouth in 1679, but the family became extinct in 1732. Caister afterwards became the property of one of the Gurney families. The ruins of this old abode, like those of its church, have been converted into farm premises. The whole limit of its walls enclosed 6 acres, the chief part forming a quadrangle, of which the N. and ‘W. sides remain tolerably perfect. 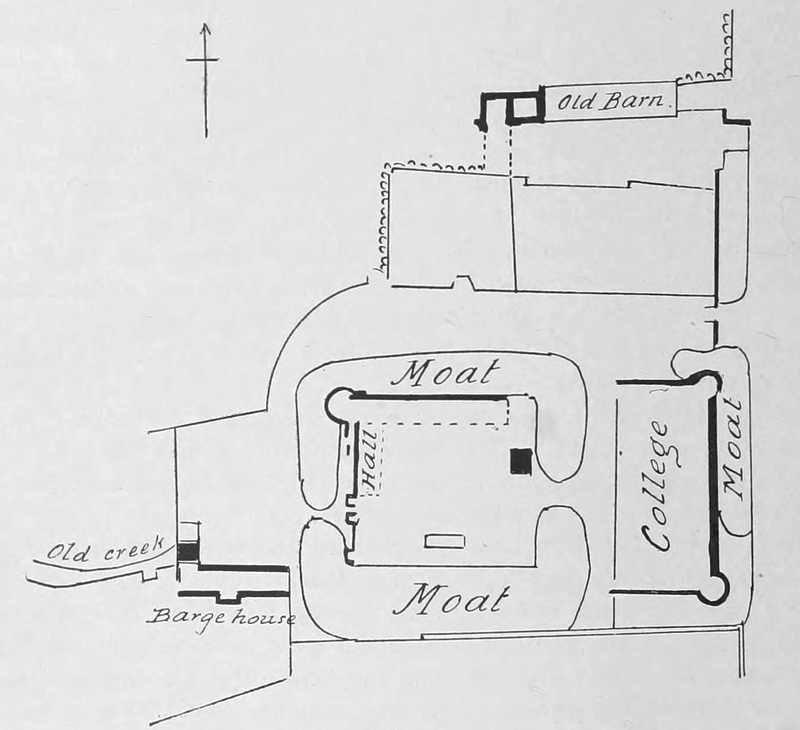 This is enclosed with a broad moat, crossing which on the E. you entered a rectangular enclosure, called the college, built on three sides of a square, the outer walls of which partly remain, with the foundations of a round tower at the N.E. and S.E. ends ; it was moated also, and a portion remains under the E. front wall, which is furnished with loops. This building contained the college and chantry, founded by Sir John Fastolf. The grand entrance was over a draw¬bridge on the W. side; on the left of this, on entering, was the great Hall, of which the six double windows remain ; it was 59 feet long by 28 wide, and at the end of it, at the N.W. angle, is a lofty and graceful round tower, 25 feet in diameter and 90 feet high, in five storeys, supported by an hexagonal turret on the left side, which contained a fine flight of stone stairs to the top ; these stairs were carried away by a clergyman for use at a new house at Wroxham for the Trafford family, so it is not possible now to ascend the tower. Adjoining the tower is the dining-room, the fireplace of which is still to be seen. On the S.W. is a large outbuilding which has a tower, and near it a large archway in the basement spanning a small creek, now tilled up, which com¬municated with the sea, and by which barges could be received ; this is called the barge-house.